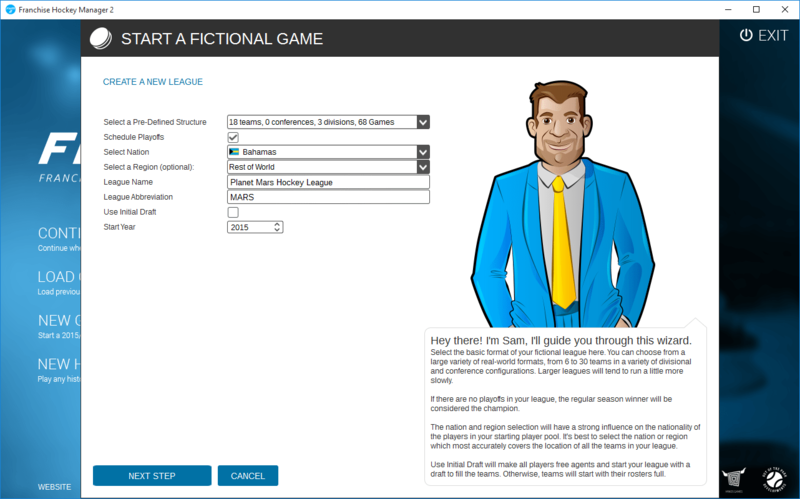 Review of Franchise Hockey Manager 2 - What a difference two years makes! OOTP should be extremely proud of themselves. To turn things around like this is remarkable. 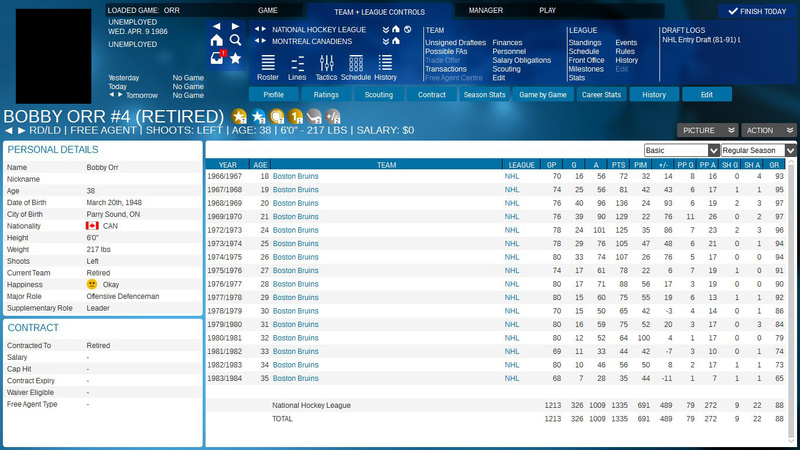 After two years, OOTP Developments are back with a brand new release of Franchise Hockey Manager. Unlike the previous two iterations (namely FHM 2013 beta and FHM 2014), this latest version drops the year from its name and is simply called FHM 2. This might seem like a very minor thing, but it marks something more significant and very positive for hockey sim fans: Finally, we have a game which lives up to the (realistic) expectations many of us had. as with EHM, I have a vested interest in FHM, having assisted with testing and research for a number of years. After reading this review, I highly recommend checking out views of other users on the OOTP Forum. This review is written predominantly with a focus on coaching/managing a hockey team rather than the sandbox/fictional mode side of the game. So if you want a real feel for how the sandbox side works, I recommend looking at the many threads on the subject over on the OOTP Forum. * Please note that the screenshots attached to this review are of the game using third party modified logos and jersey images available online. The game ships without any logos or player images. The game offers three modes; modern, historic and fictional/custom. 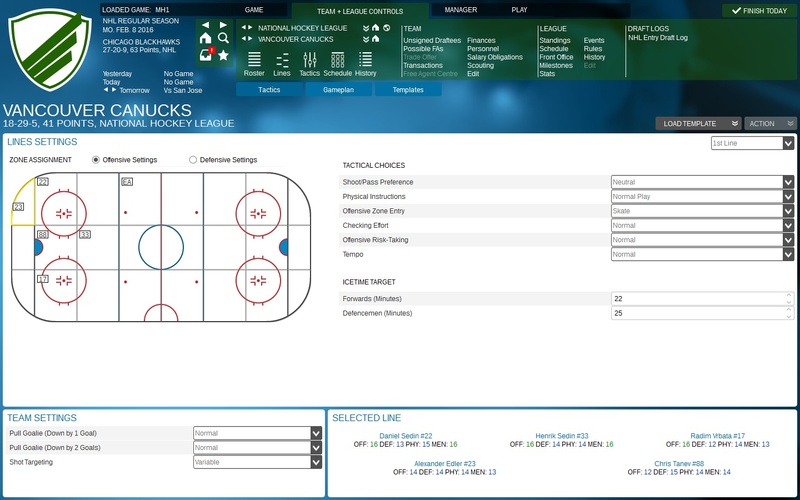 The modern game has 21 playable leagues from throughout the world of hockey, ranging from North America to Europe and Asia. Some of the leagues’ rosters are fully up to date as of 2015/16 whereas others are currently out of date. This is really down to the number of volunteers that offer to help research the leagues rather than anything the developers can really control. 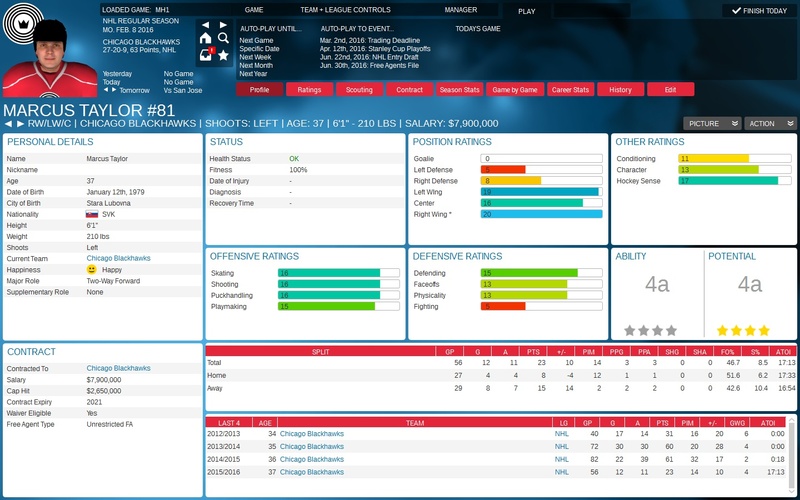 It should be noted that plenty of work is going on behind the scenes to try and get all of the leagues fully up to date – so keep an eye out for future roster updates from OOTP. It is also worth noting that there are no national teams or national tournaments in the game. Understandably, North America has been the main focus during development of the game and it really shows when comparing the in-game experience of the NHL/AHL with that of European leagues. Currently the European leagues feel a bit like they have been shoe-horned into a North American template. Many European-specific rules and features are missing right now (such as rules allowing unlimited foreigners to be present on a roster). A particular issue is the NHL-style 23 man active roster limit imposed on every European league and the rigid requirement that you must dress four lines (and players cannot play on more than one line); this really hampers smaller European teams that typically dress only three lines. 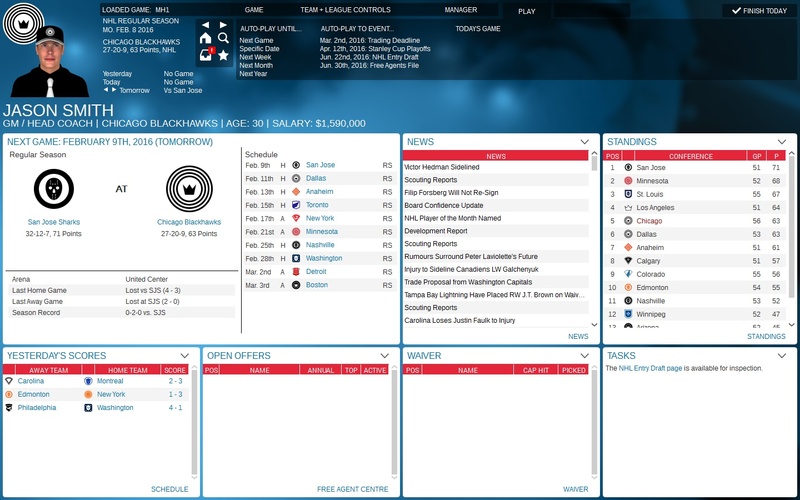 It also results in teams acquiring large rosters of similar sizes to NHL teams rather than sticking to small rosters as they would in real life. The devs are well aware of this and I know it is hoped a patch and/or FHM 3 will see a more rounded European experience. The historic mode is, in my view, the jewel in the crown. Every NHL and WHA season from 1931/32 onwards can be simulated. 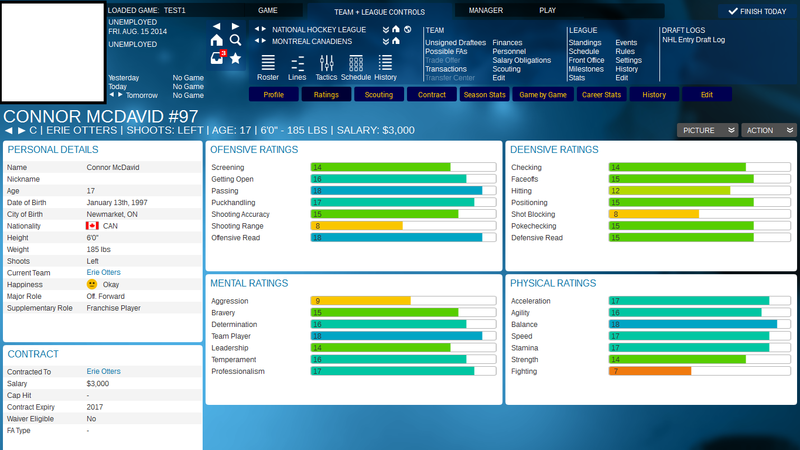 There are two different ways of playing; players can develop and retire as they did in real life or they can develop and retire dynamically using FHM’s development engine. The former allows you to play out each season just as in real life whereas the latter allows for more unpredictability with potential for things to unfold in a very different manner. Whichever option you choose, you will not be disappointed with the experience. It’s a great deal of fun and the possibilities are endless. The third of FHM’s modes is the fictional/custom mode. I won’t profess to have much expertise in this area, but there is a great deal of flexibility (such as number of conferences/divisions/teams, customising game rules and adding farm and/or junior leagues). The new game wizard means creating a new custom game is incredibly straightforward and user friendly. 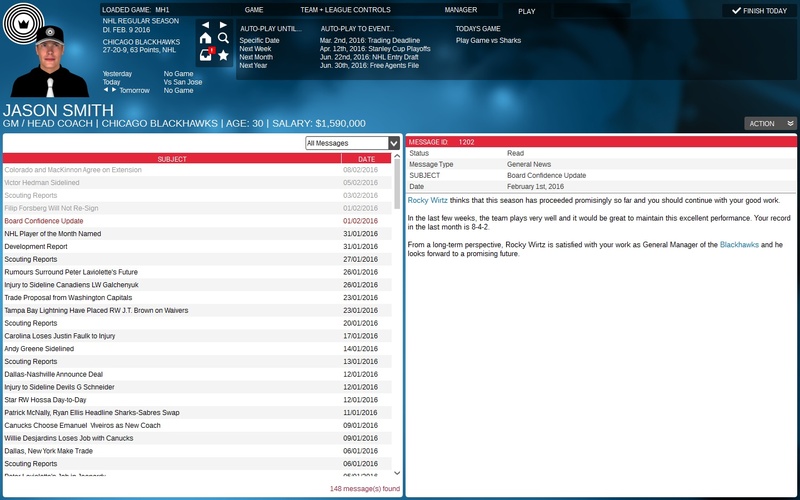 In addition to the three game modes, it is now possible to play FHM as an online multiplayer in the same style as OOTP. There is also the possibility to play multiple GM/hotseat mode but it feels more like the online multiplayer commish style of play rather than being true hotseat mode within the traditional single player style. The first thing that is striking when starting the game is how different it looks compared to FHM 2014. The new interface is slicker and more modern when compared to its predecessor. More importantly, the navigation system has been completely redesigned from the ground up. The jarring UI experience in FHM 2014 with a myriad of submenus within submenus is no more. In its place is a much more logical ribbon menu-style system running along the top of the screen. Navigating around the many different screens is now far easier and compliments the gameplay. A really neat feature is the mini pop-up window that appears whenever you hover the mouse over a player’s name. The pop-up provides some basic bio data and the past couple of seasons’ worth of stats. It’s a really small thing, but it a makes a big difference to day-to-day playing as you can quickly check a player’s basis stats rather than having to delve into the full profile screen. A similarly useful function is the action menu which appears when right-clicking on a player’s name. Again, it makes key managerial controls that much quicker and easier to use. A further major development is the much anticipated introduction of FaceGen. Every player and staff member now has a photo realistic face image which can be customised as much as you wish. The images are not true to life; rather they are randomly generated with each new game. However, there is the ability to generate true to life images and import them into the game (cue third party mods!). My favourite aspect of FaceGen has to be the jerseys. Already there are fan-made jerseys for many teams in the game (including a remarkable project to recreate every historic NHL jersey since the 1930s). Even for those teams without, the game generates a generic one based upon the team’s colours. Overall, the user interface is very nicely done indeed. There are however a few issues here and there. For instance, it is not immediately obvious how to respond to a message in the messages screen (e.g. responding to a trade offer). At first glance, the Action button above each message only has the usual message options such “mark all as read”. However, in amongst these options are also the options to respond to the messages, such as responding to a trade offer. It might make more sense to separate these two categories of options/actions into two buttons; and perhaps with the “respond to trade”, etc buttons located below the message so that they are easily visible once the message has been read through. There are also some issues with the Tactics and Match screens which I will get onto later. But the odd niggle here and there is to be expected and none of these issues impede upon the enjoyment of the game. 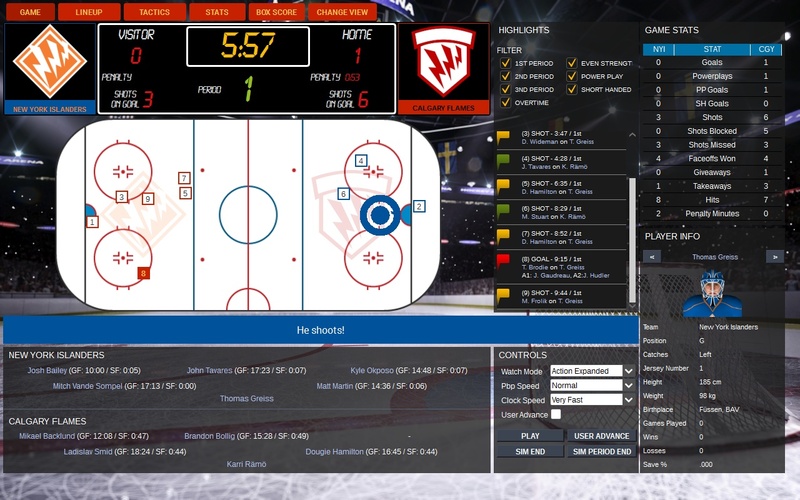 As with EHM, it is hard to know where to begin with describing the coaching and managing features of the game. It is fair to say that all of the key coaching and GM functions are present in game. Pre-season, team practice, scouting, drafting, trading and setting lines and tactics are just a taste of what FHM has to offer. All of the standard line types are available when setting the line-up of your team (e.g. even strength, powerplay, penalty kill, etc). Setting the lines is, however, a bit awkward right now. Each individual slot must be filled by dragging and dropping the player into the slot. With 75 slots to fill, that is an awful lot of dragging and dropping. 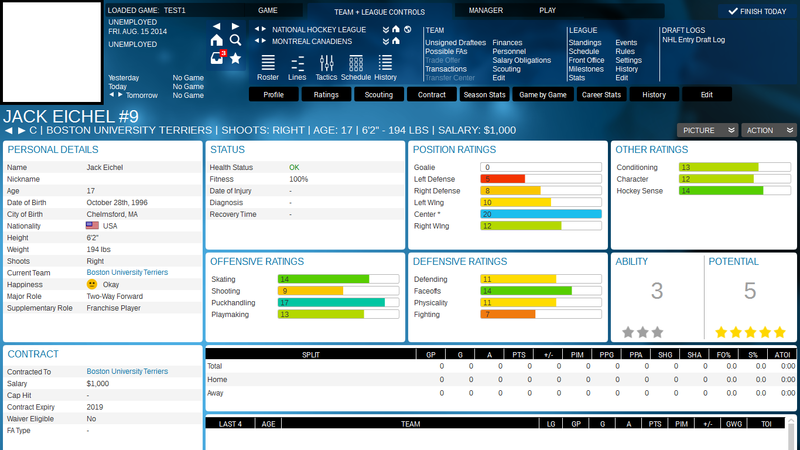 The ability to highlight a player and then simply clicking on the chosen slots is sorely needed. This issue is made worse by the fact the game will not allow you to continue if you have an injured player in your line-up; regardless of whether or not you have a game that day. This can mean constantly adjusting your team’s line-up simply to allow the game to progress to the next day. It’s a constant battle and can get pretty frustrating if you suffer a spate of short injuries. In terms of tactics, the game is much improved over FHM 2014. There are plenty of slider-style settings to adjust things such as tempo, shoot/pass bias, checking, etc. Ice time can also be set on a line-by-line basis. An aspect I really like is the ability to set period-by-period offence/defence settings according to how many goals ahead or behind the team is. This is an extremely useful feature; particularly if you’re like me and tend to increase/decrease the aggression depending upon the score line and how far advanced the game is. The only aspect that is really missing from the tactical settings is the use of various offensive and defensive systems teams tend to use in real life; such as umbrella, 1-3-1, etc on the powerplay and diamond and tight/wide box on the penalty kill. There is a diagram in the tactics screen that shows the positioning of your players on the offence/defence, but none of the tactical settings available appear to have any bearing on the positions. The game uses player roles rather than individual tactical settings. Those who like to micromanage individual tactical settings might find this a little disappointing, but I feel the introduction of roles makes for a better system. 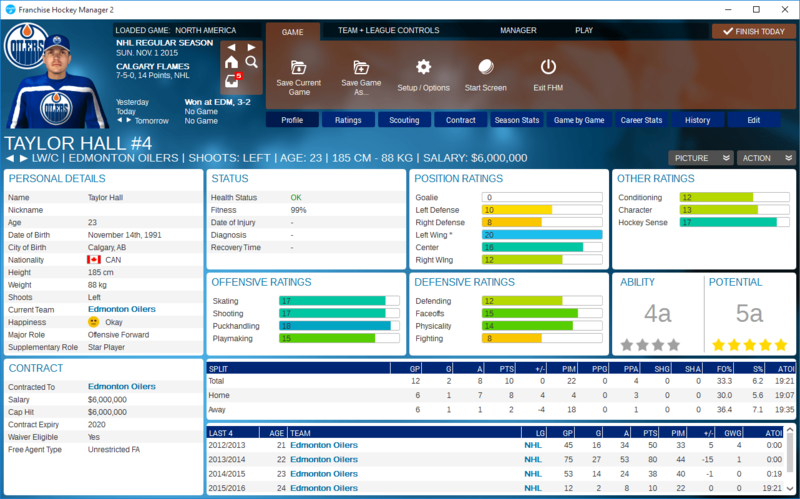 Firstly, there are plenty of roles available and so you can tailor a player’s role to quite some extent. Secondly, the player’s role has a bearing on their game rating. For instance, a poor defensive performance will significantly impact the rating of a player on two-way forward role but will not significantly impact the rating of an offensive forward. This makes game ratings far more valuable and reflective of a player’s role rather than simply being a restrictive one size fits all style of rating. Scouting is done very well. 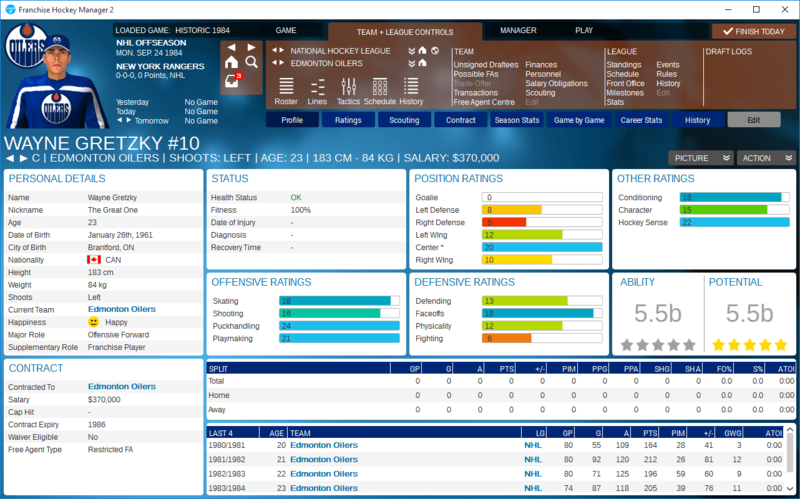 A full report with overall rating information is available for every player scouted. The accuracy of the report varies according to how good the scout is and how recently the player was scouted. The match engine generally produces realistic looking results and statistics. The re-write of the match engine really is paying dividends and makes for a very significant improvement over the stats generated by FHM 2014. Although there are reports of a few issues here and there, these will be hopefully be ironed out in time and they do not detract from what is a very decent match simulation. The in-game experience consists of a chart showing the approximate location of the action along with text commentary. 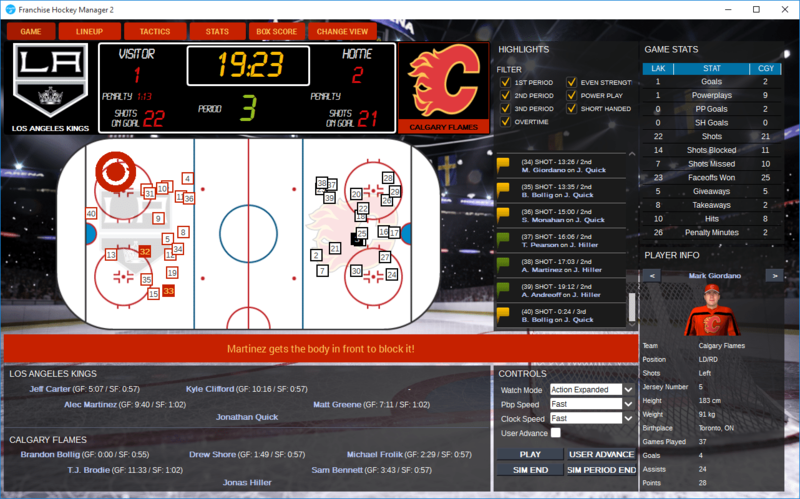 It may not be the bells and whistles experience of the 2D match engine of EHM, but it does the job just fine. The action can be followed with ease and there are plenty of match stats that can be viewed as the match progresses. There are also plenty of highlight settings so that you do not have to watch the full game commentary if you do not want to. Perhaps more importantly, certain tactical settings cannot be adjusted during the match; namely the player roles and the period-by-period offence/defence settings I mentioned earlier. Suddenly these incredibly useful settings can become a hindrance. What if your penalty kill is struggling and you want to change your enforcers’ roles to something less aggressive? It seems this can’t be done and, seeing as players cannot be benched, you’re stuck for the entirety of the game. Doh! FHM offers a plethora of in-game customisation. 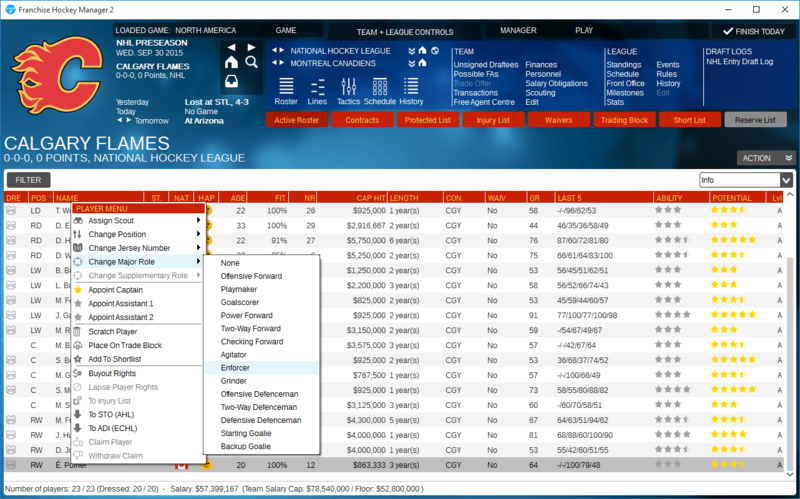 Player, team and basic league data can be edited on the fly at any time. More advanced league settings can be edited during the off-season (in order to ensure game stability). I have often started a new game with other sims in the past only to see a big trade occur in real life, making me consider editing the database and starting again. With FHM I can easily incorporate that trade into an existing saved game and carry on playing. The level of customisation is great and it seems to have none of the instability with which FHM 2014 suffered. Unfortunately there is not an official or third party pre-game editor right now, and so editing the database is impossible. Strictly speaking, quick start games can be created from an existing saved game; but this does not offer the same sort of flexibility as database editing. Further, you lose the dynamically created attributes which are generated when creating a new game from a database. Hopefully this is something we’ll see in a future version of the game and, in any event, there should be a steady supply of roster updates from the developers so long as the game is actively developed. Two years ago, the general feeling amongst most people towards FHM was very negative. The UI was awkward and the game full of critical bugs and limitations. Two years on and we have a completely different experience. The game is extremely good in many ways. Sebastian and co at OOTP should be extremely proud of themselves. To turn things around like this is remarkable. FHM 2 has a great deal to offer hockey fans, but I can’t say I agree with OOTP’s audacious claim that it is the greatest hockey game in the world. FHM 2 does some things very well indeed (and better than EHM) and other things not so well. Most importantly, the game is enjoyable, engaging and generally realistic. Major strengths are the historical mode, fictional/custom mode, plenty of history and stats tracking, some nice tactical and UI features and a highly customisable in-game experience. Areas which are lacking right now are certain aspects of tactics and the match engine, the European experience, roster management and a complete absence of any international hockey tournaments (and I have reflected this in the Gameplay and Replay Fun Factor ratings below). 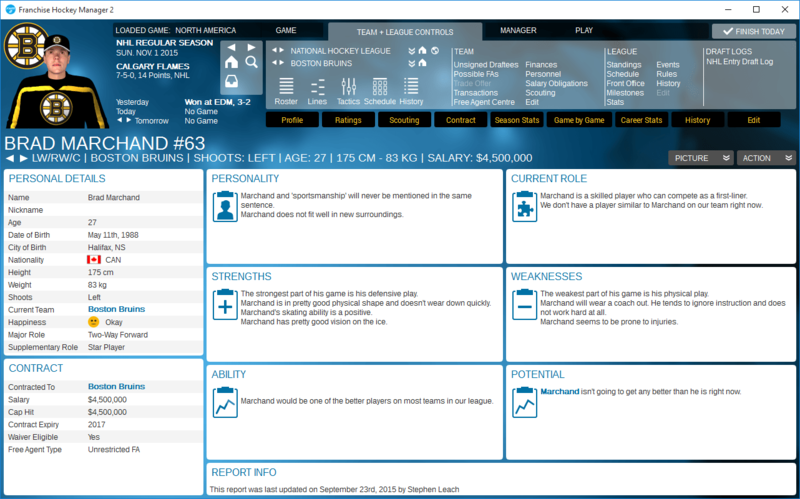 However, given how far the game has come over the past two years, I’m confident the areas for improvement will indeed improve with post-release patches and/or in FHM 3.
archibalduk is founder and webmaster of The Blue Line, an Eastside Hockey Manager community and resource which he has been running since 2004. He has been a tester for the Eastside Hockey Manager and Franchise Hockey Manager series of games for a number of years now. When he's not working on roster updates and editors, he's usually at a rink or arena somewhere in the UK watching a hockey game. archibalduk also has a love of soccer and has been a big fan of the Football Manager series by Sports Interactive since the mid 1990s.